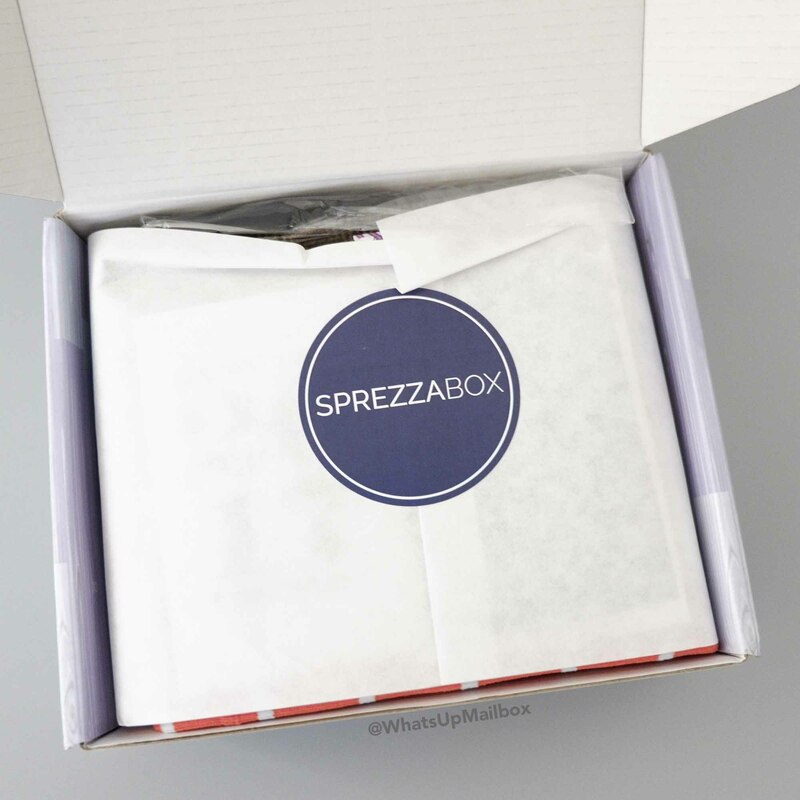 Sprezza Box January 2017 Review + Coupon! Cost: $28/month + Free Shipping. What’s in the box: You’ll receive 5-6 of the latest men’s fashion, lifestyle and grooming products from new and up-and-coming brands all delivered to your doorstep!  Coupon: Use coupon code WHATSUPMAILBOX to get 10% off your first box! 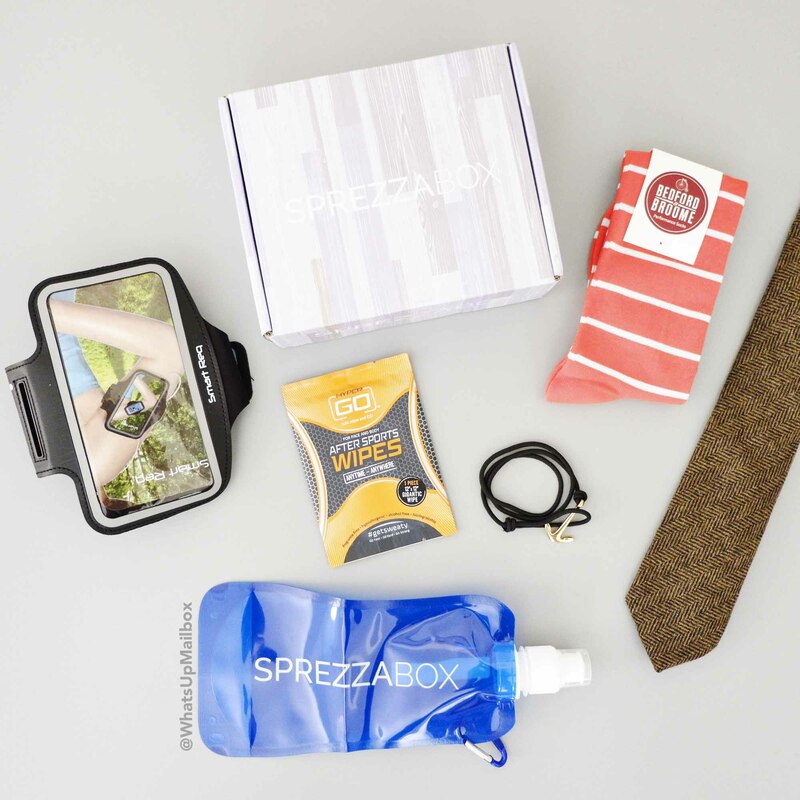 Sprezza Box is a men’s accessories subscription box that delivers items such as ties, pocket squares and all other cool outfit add-ons that will surely upgrade your look. First look at unboxing shows their packaging that’s sealed with their logo sticker. Open the seal and you see the items nicely packaged inside with the info card on top. 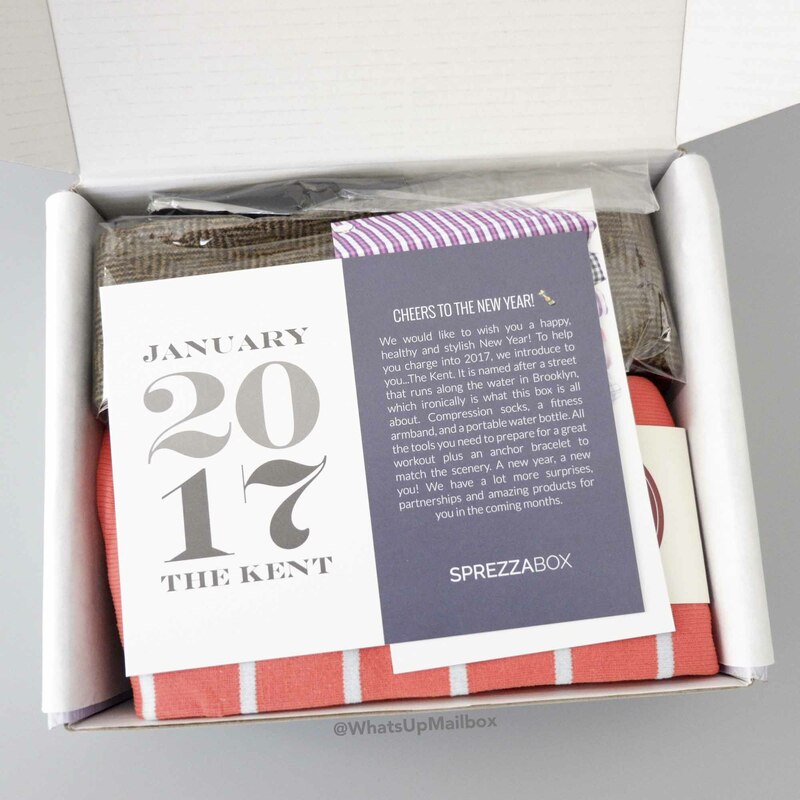 This month’s box title is “The Kent”, which is a street that runs along the water in Brooklyn, and it celebrates a happy, healthy and stylish new year! 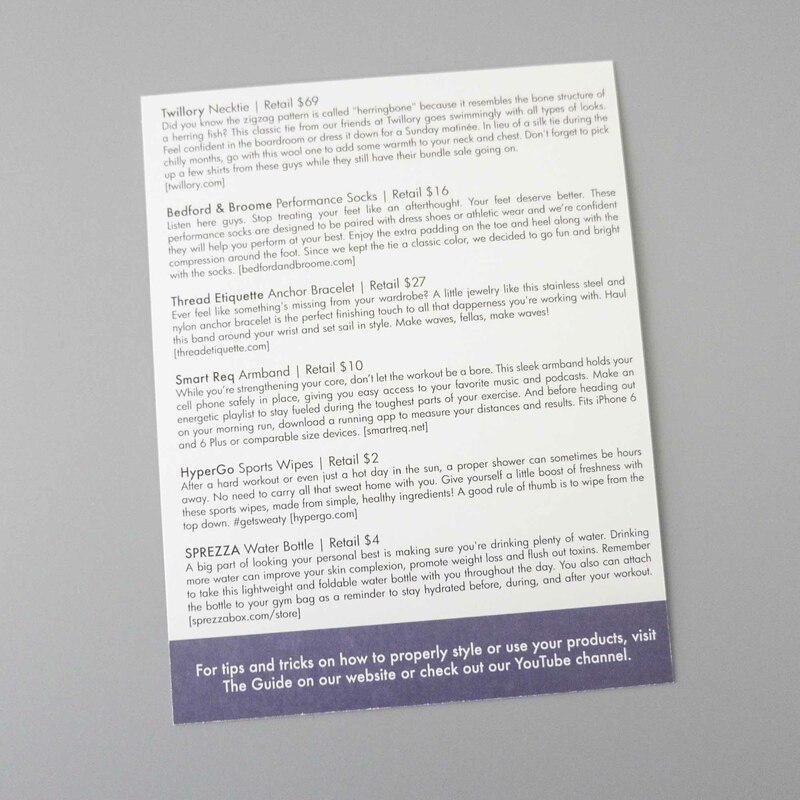 The back of the info card lists all the items in the box as well as their values, as shown above. 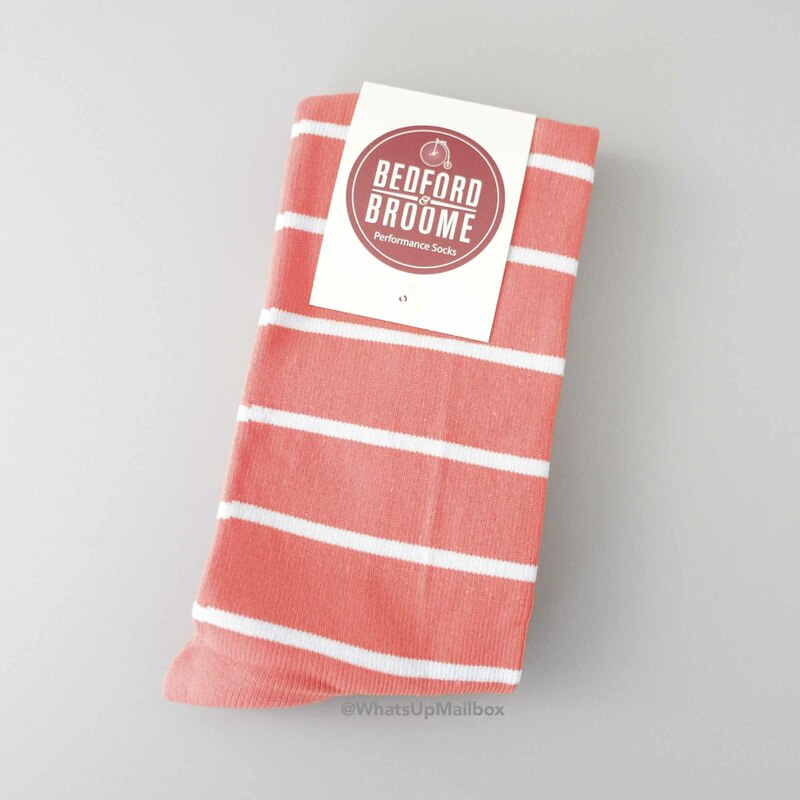 These performance socks can be worn with dress shoes or athletic footwear. It’s made with extra padding on the toe and heel, plus compression around the foot so it stays put. 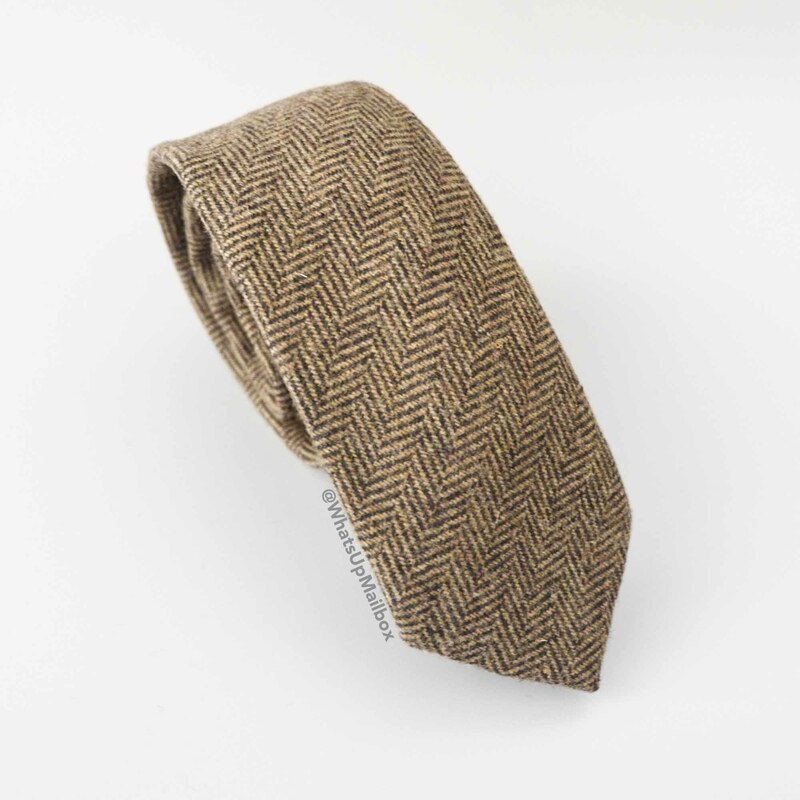 A herringbone pattern is always a classic. And when you combine that with light and dark brown color, you got yourself a vintage gentleman look that is nothing but dapper. The color is also versatile, so you can definitely wear this with pretty much any color, and you can either wear this for casual days, or for that upcoming important meeting you have next week. 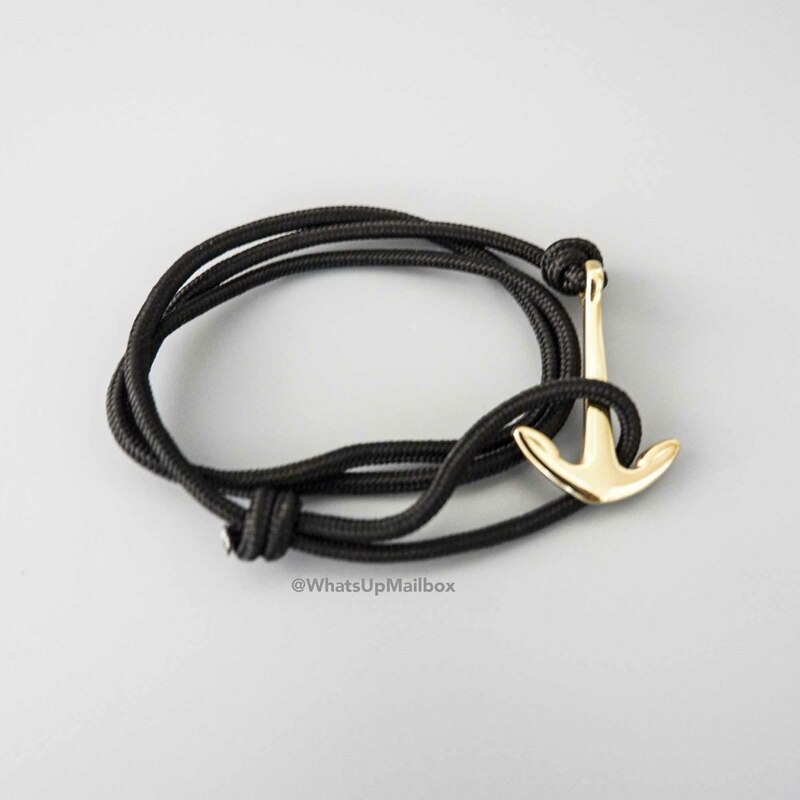 A small piece of jewelry is always a nice finishing touch to your outfit of the day, and this nylon anchor bracelet will do just that. 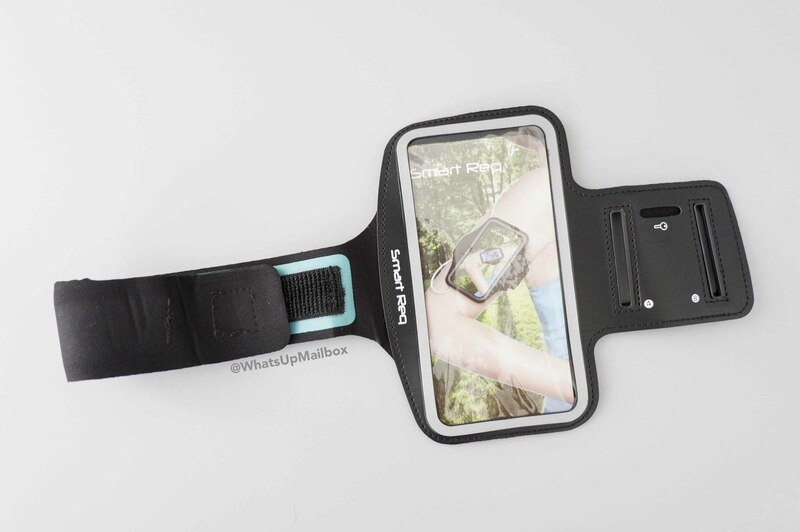 I used to wear armbands when I was jogging a lot, and they were definitely much better than holding the actual phone on hand, or tucking it in to my pants (we’ve all done that before). It fits both iPhone 6/7 and iPhone 6/7 Plus, has an opening for the cables of your headphones to go through, AND it also has a pocket to insert a key (house, locker or a small car key). This will definitely be used asap! 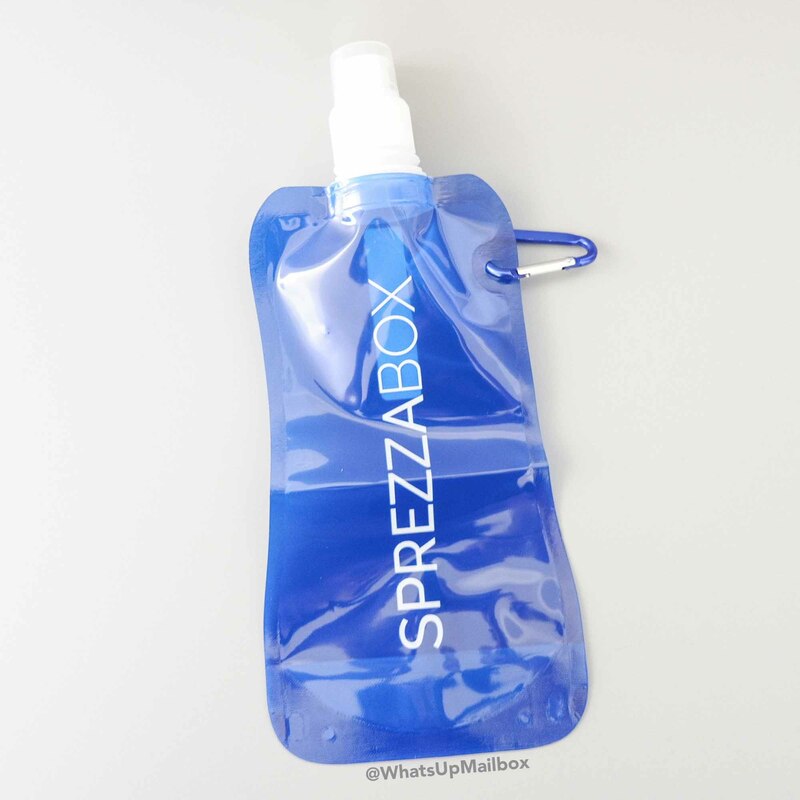 I love foldable water bottles! They’re so useful and don’t take much space no matter where you’re taking it. Most bottles take the same amount of space even when the water is all gone. But with this foldable bottle, once the water is gone, you can just fold it (from bottom to top) and voila, flat and ready to go. Love it! We all know too well that when you’ve worked out hard and heavy, you sweat just as much. Sometimes you sneak in a little workout session when you have time, but you don’t have time to take a shower immediately after. 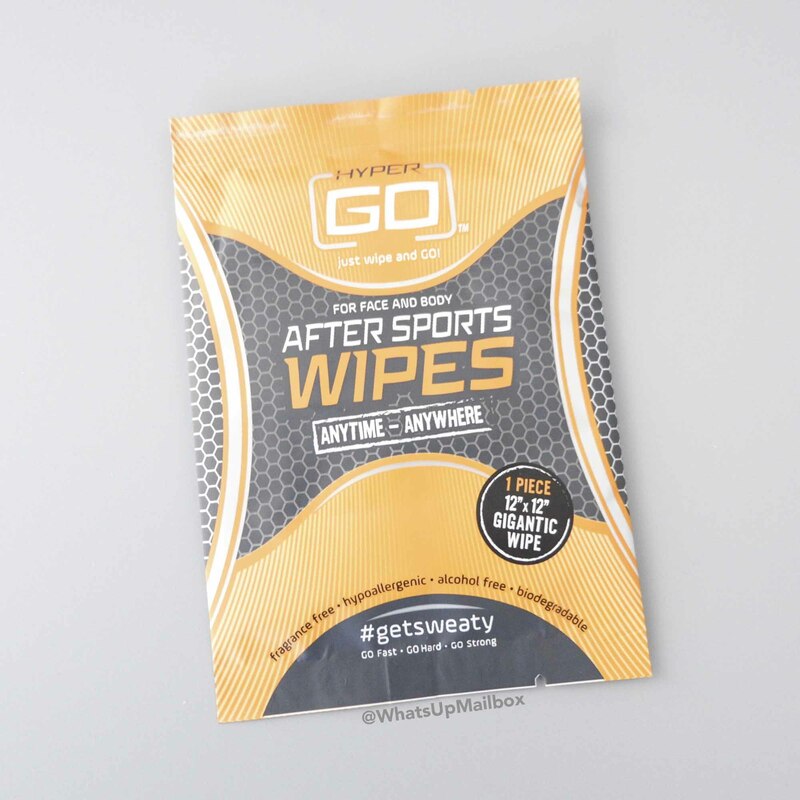 These wipes can help in situations where you need some freshness without the need for an actual shower. Just wipe from top to bottom (these can be used on the face too!) and you’re all ready to go about your day again. My Thoughts: This month’s items are very appropriate for the new year! It inspires you to workout and it includes stylish accessories because this year is going to look better than last! I definitely love the variety of items, all very useful and good quality. A good curation for January, and a good start to the year! Not a subscriber? You can join here to start receiving their monthly dapper accessories. 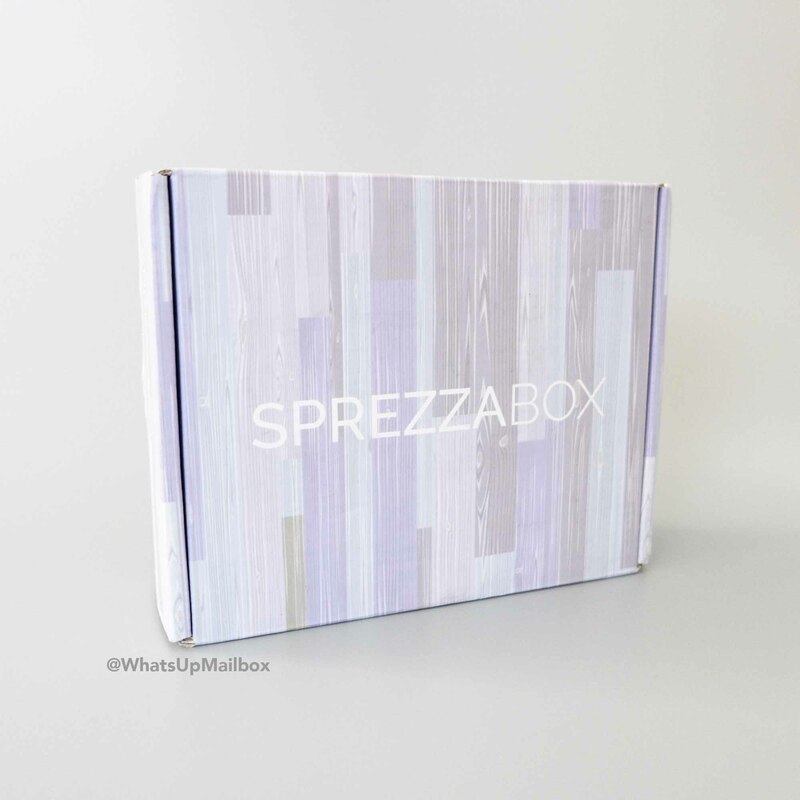 And don’t forget to use coupon code WHATSUPMAILBOX for 10% off your first box!